This Authentic Southern Miss XP Helmet by Schutt features the streamlined AiR XP shell with a metal faceguard, an authentic interior TPU cushioning set complete with TPU jaw pads, an ION hard cup 4-point chin strap and authentic Southern Miss helmet decals. For display only - not to be worn. This Authentic Southern Miss Alt. 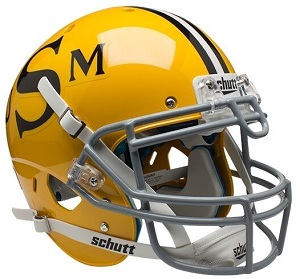 Gold XP Helmet by Schutt features the streamlined AiR XP helmet shell with a metal faceguard, an authentic interior TPU cushioning set complete with TPU jaw pads, an ION hard cup chin strap and authentic Southern Miss helmet decals. For display only - not to be worn. 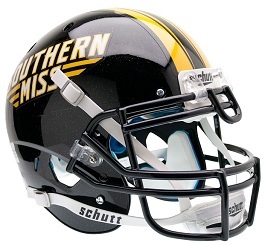 This full-size replica of the authentic Southern Miss XP football helmet by Schutt is great for autographs or display! 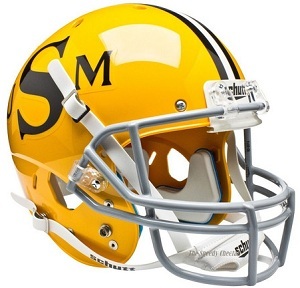 The helmet features an authentic steel faceguard, 4-point chinstrap and official Southern Miss helmet decals and colors. For display only. Not to be worn. This full-size replica of the authentic Southern Miss Alt. Gold XP football helmet is great for autographs or display! 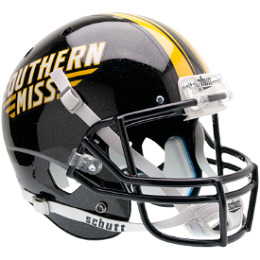 The helmet features an authentic steel faceguard, 4-point chinstrap and official Southern Miss helmet decals and colors. For display only. Not to be worn.